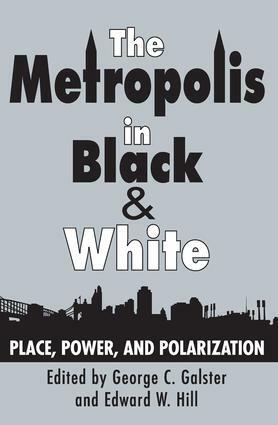 The Metropolis in Black and White highlights a stark fact: America's metropolitan areas are more polarized along racial lines than at any time since the mid-1960s. Though urban areas have become multicultural, the editors argue that black-white racial differences will outlast ethnic differences in metropolitan America and that the race issue in most urban areas is perceived as a black-white one. Galster and Hill perceive that the theme of place, power, and polarization is most powerful when blacks and whites are contrasted. African Americans, on average, are the poorest, most segregated, most disadvantaged urban racial (or ethnic) group, because they are deeply entangled in the web of interrelationships connecting place, power, and polarization. Since these interrelationships form a comprehensive set of social structures that oppress African Americans, they can be judged to be racist at their core. Race, not merely class, continues to play a pivotal role in shaping urban African Americans. In clear analyses, the contributors examine employment, income, the underclass, education, housing, health and mortality, political participation, and racial politics. Intertwined themes of spatial isolation, political empowerment, and racial disparities-place, power, and polarization-guide the analyses. Thisis a vital text for courses in urban affairs, American studies, economics, geography, sociology, political science, urban planning, and racial and ethnic studies. In clear analyses, the contributors examine employment, income, the underclass, education, housing, health and mortality, political participation, and racial politics. Intertwined themes of spatial isolation, political empowerment, and racial disparities-place, power, and polarization-guide the analyses. This is a vital text for courses in urban affairs, American studies, economics, geography, sociology, political science, urban planning, and racial and ethnic studies. What Happened to African-American Wages in the 1980s?